We are engaged in developing quality Fermenter/ Bioreactors that transforms organic matter into alcohol and acidic goods, such as alcoholic beverage, honey, short mead. 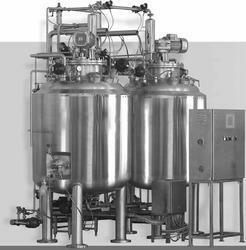 It is made of stainless steel as many of the fermentations process produce acid. The interior of our fermenter can be easily monitored by sterilisable probes that records temperature, pressure, stirrer speed, pH, oxygen and carbon dioxide levels. Here, the incoming air is filtered and pumped into the base of the fermenter and valve releases the pressure from the top of the tank. 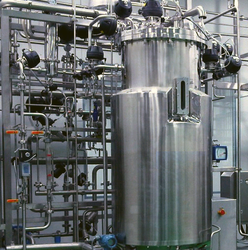 We are engaged in design and manufacturng of Inplace Sterilizable Fermenter for various fermentation applications. The process parameters such as temperature, pressure, stirrer speed, pH, oxygen and carbon dioxide levels can be monitored by our IndusdaQ software. 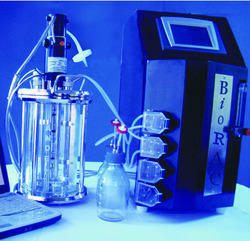 Semi-automatic and fully automatic control of process. Superior quality of stainless steel and precise process control. We are being appreciated for providing our clients with the best gamut of Process Vessel & CIP System. These products are fabricated by making use of supreme quality required raw material that ensure longer service life and sturdiness. Furthermore, these products are provided with wheels that ensure their portability. The offered products are ideal for cleaning and processing equipments such as Blenders, RMG, FBD that cannot be shifted to wash areas. These portable cleaning system can be availed from us with or without jacket.